§ 475.015 Relationship of guardianship provisions to uniform veterans’ guardianship ..
§ 475.050 Appointment of guardian or conservator of disabled or incapacitated persons ..
§ 475.081 Persons having disappeared, absent from country, or forcibly detained, to ..
§ 475.097 Conservator or guardian ad litem — conflicts of interest, removal. § 475.105 Letters of guardianship or conservatorship — form. § 475.115 Appointment of successor guardian or conservator — transfer of case, procedure. § 475.123 Medical and surgical procedures — consent — emergency. § 475.190 Investment of liquid assets of estate of protectee — reports. § 475.200 Purposes for which property may be sold — petition, examination, order. § 475.205 Claims against estate — procedure. § 475.210 Filing of notice of pendency of action in other court against conservator, ..
§ 475.230 Sales of real estate, how made — notice required. § 475.270 Annual settlements required, when, exception — information required. 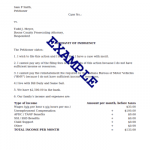 § 475.280 Settlement and report dockets — notice to conservators and guardians. § 475.290 Final settlement required, when — notice. § 475.295 Death of conservator, personal representative to make settlement — waived when. § 475.310 Estate delivered by resident conservator to foreign guardian or ..
§ 475.320 Death of protectee, distribution of estate — administration, when. § 475.405 Proof of necessity for appointment — minority. § 475.410 Proof of necessity for appointment — incompetency. § 475.425 Filing of accounts — notice of hearing. § 475.480 Application of provisions relating to surety bonds and administration of ..
§ 475.521 Definitions — significant connection factors.